Winkler Family Bible (ca. 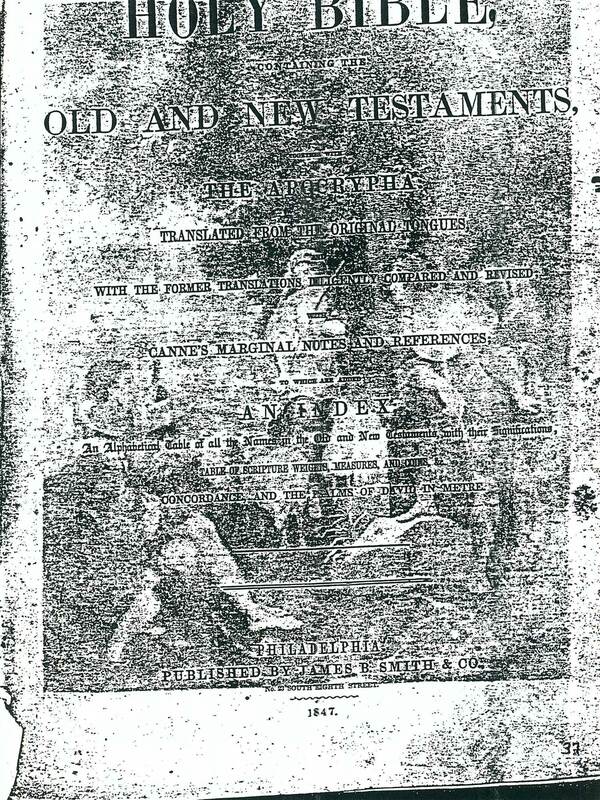 1847)Lawrence Winkler was born on 15 Jan 1771 to whom we believe is Hans Jacob Winkler. It is most likely he was born in either Morris County, New Jersey or Morganton, Burke, North Carolina or Rhine River area of Prussia, however, is not known for certain if this is true. It is also believed he had 3 brothers, Joseph, Conrad, and Thomas who also lived in Morganton but a direct and definitive relation other than the Winkler name has yet to be discovered. 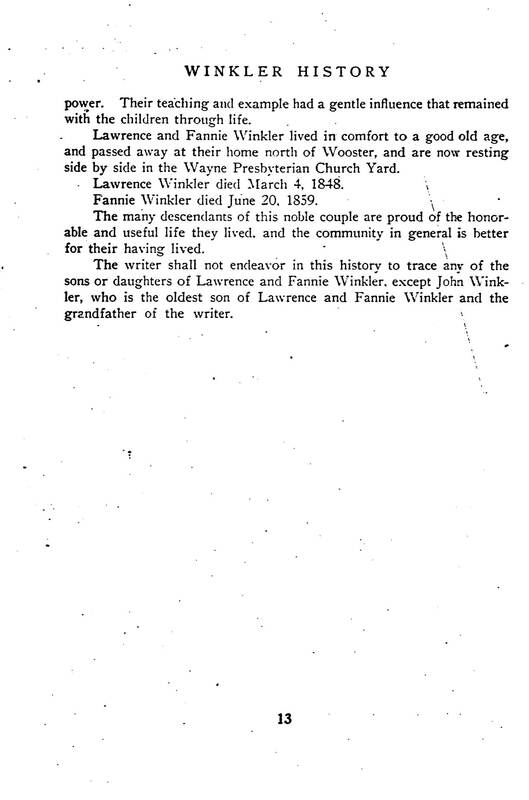 If we assume Lawrence was born in New Jersey, his mother was likely Lydia Colver-Winkler*. 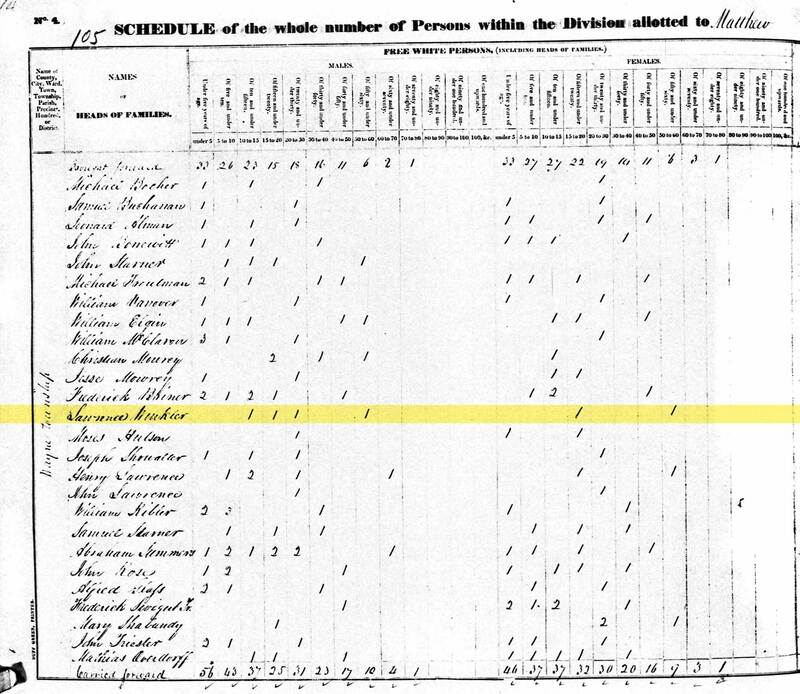 We know by 1786, when Lydia's father Thomas dies, that she has since left New Jersey and can be found on the 1790 census under husband Jacob in Burke County, North Carolina (p. 108, with 5 males over 16 and one female). It's also possible that Lawrence was from eastern Pennsylvania, as DNA results show the 3 brothers had multiple children whose births are noted in PA near the Pennsylvania-New Jersey border before relocating to Burke County. 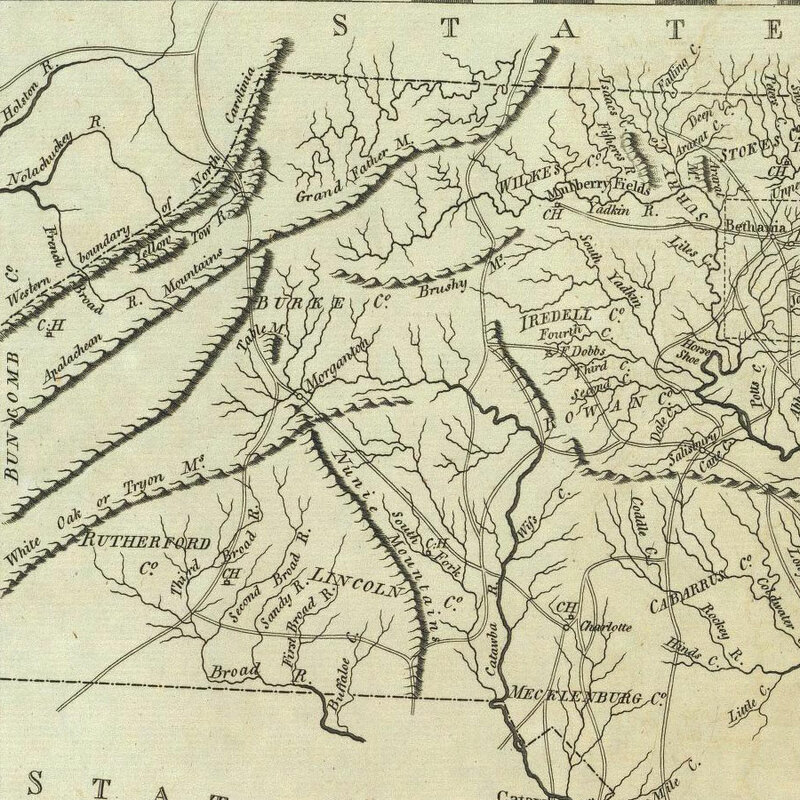 Either way, the timeline points to the family relocating to the frontiers of North Carolina, close to the Appalachian mountain range around the time of the Revolutionary War, which means rising tensions and the increase or actual threat of warfare is what likely led the Winkler families south and out of the New England area. 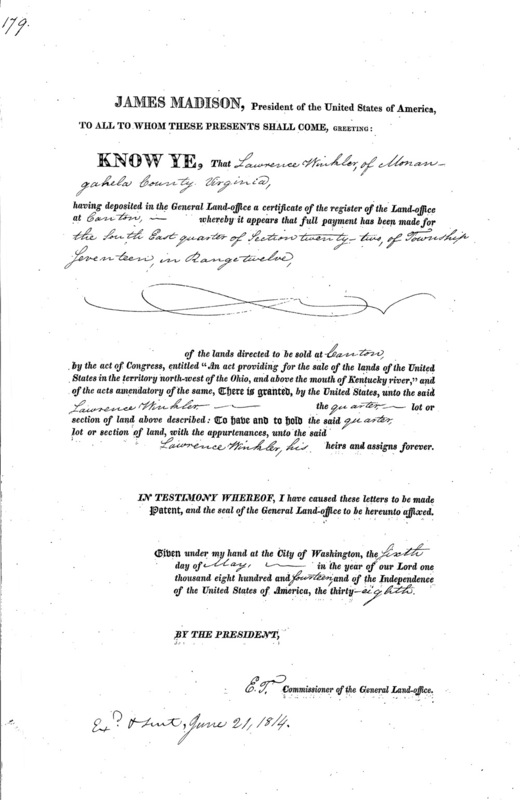 Lawrence Winkler married Frances "Fannie" Paine in 1795. A commonly held belief is that Fannie was from New Jersey and this is also where the marriage is said to have taken place. Not only is there a lack of proof to support this, but evidence leads us to believe that they married in Burke County, North Carolina instead. Backing up this belief is that Fannie's parents are known to have relocated from Spotsylvania County, Virginia to Burke County, North Carolina shortly after selling their property in Virginia on 9 Dec 1783... there is no mention of New Jersey in the Payne family and they even appear on the 1790 census in Burke County (5 years before Fannie's supposed marriage in New Jersey). Plans changed when the family had to halt relocation in the middle of what is now Monongalia County, West Virginia, because of sickness** (Monongalia was still a part of Virginia at the time as Virginia didn't split into 2 states until the Civil War). 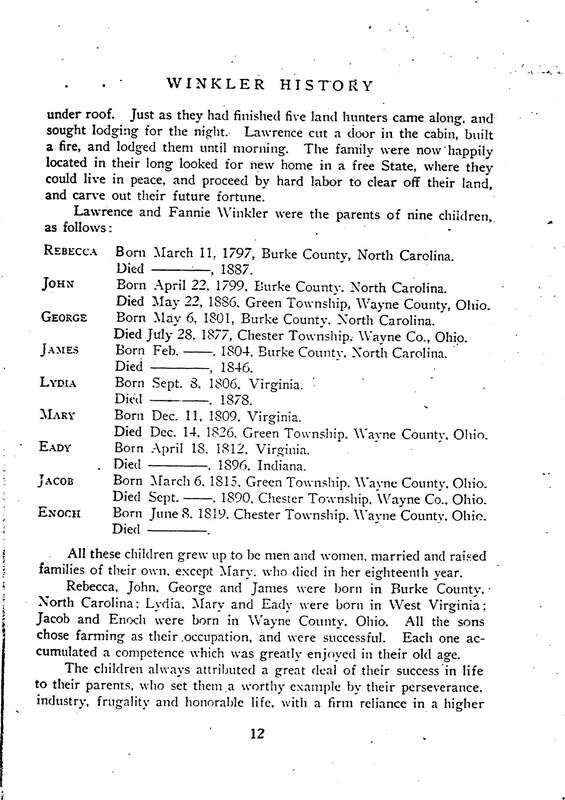 Over the next seven and a half years the family lived in Monongalia County2, 3 where Lawrence and Fannie would welcome 3 more girls to the family. It wouldn’t be until Feb 1814 when Lawrence finally would decide to continue his journey northward to Stubenville, Ohio. 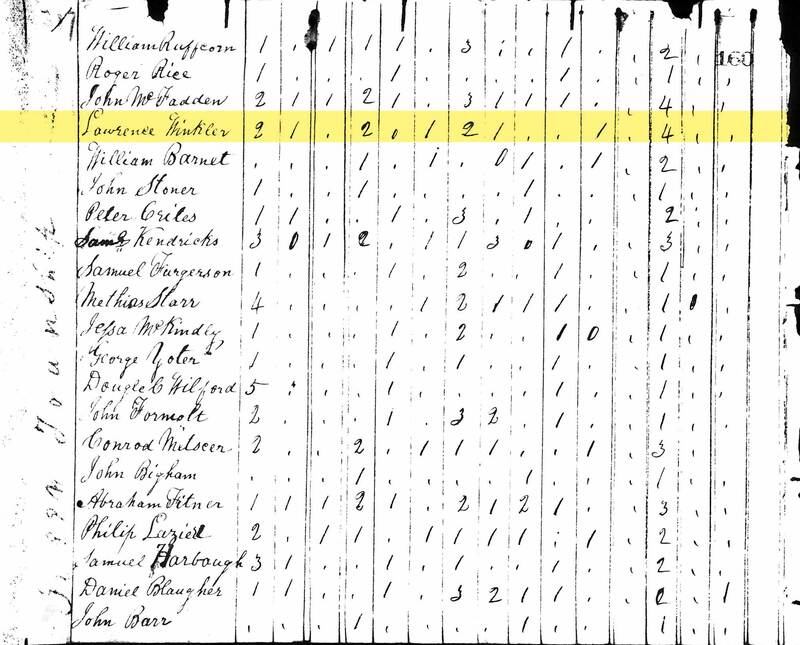 1810 US Census for Monongalia Co.Lawrence set out with his eldest son John. They took one horse on which to carry provisions and occasionally ride. They also drove one cow and calf. They crossed the Ohio River at Steubenville (about even latitude with Pittsburgh), where some of his relatives lived, and where he had expected to locate. *** Not being pleased with the country there, he obtained considerable information about the country farther north, and decided to travel on to Northern Ohio. 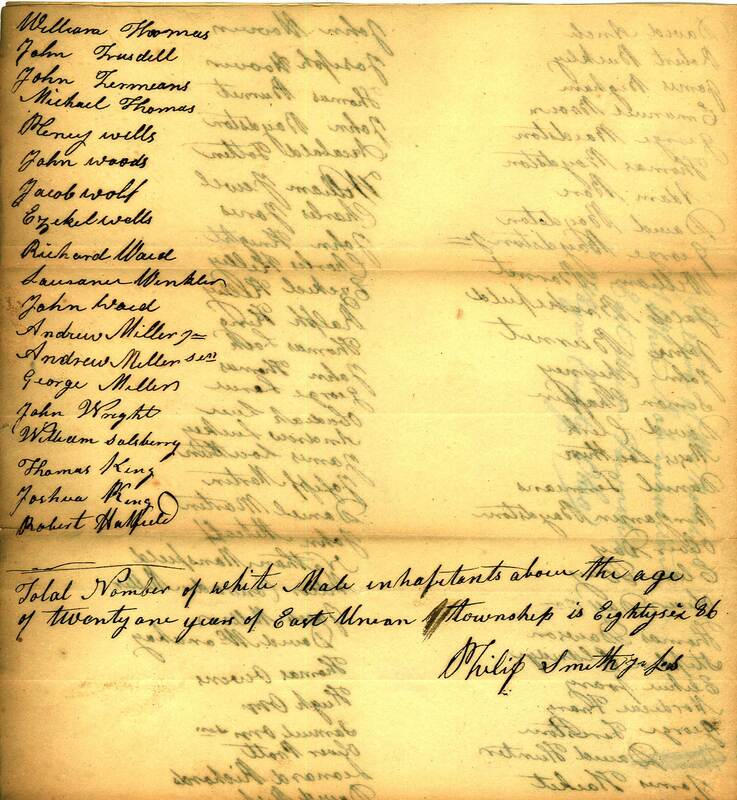 Lawrence’s Brother-in-law Jacob Brackbiel had preceded him and settled in what is now Wayne County. C The country was almost an unbroken wilderness covered in lush forest. After they left Canton, Ohio, it was with great difficulty he found his way and arrived at Jacob's cabin; safe, but weary and sore. 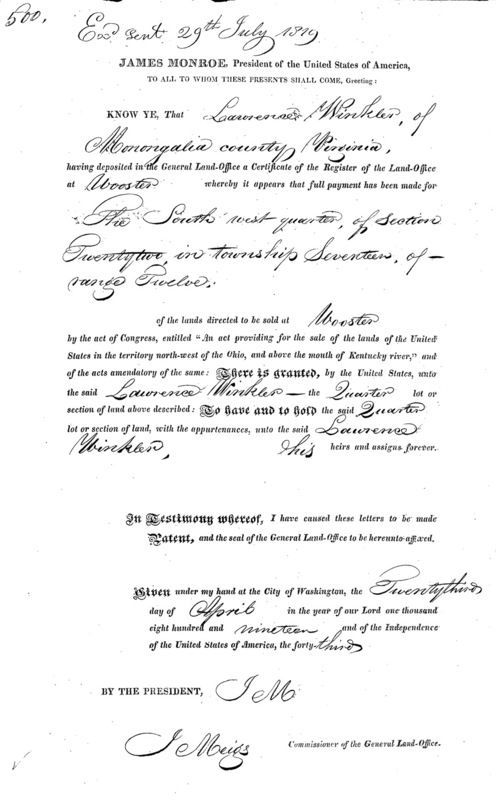 Winkler Land Patent Certificate (1814)Upon returning, Lawrence and son John immediately started to set up camp and shelter from weather and wild animals. They proceeded to erect pens for their horse, cow and calf. They cleared a small area of land and planted potatoes. Then, they staked off four acres and began chopping trees, clearing brush and preparing logs to build a cabin. It took Lawrence and his son 3 months to clear the area and prepare all the logs needed for a house. When finished, they packed up and headed for Virginia. On 01 Oct 1814, Lawrence left Monongalia County, Virginia (WV) with the entire family to return to East Union (later Green Township). NOTE: It should be mentioned that at this time America was in the middle of the War of 1812 with Britain and the Native Americans. Months prior, in August of 1814, Washington DC was practically burned to the ground by the British. 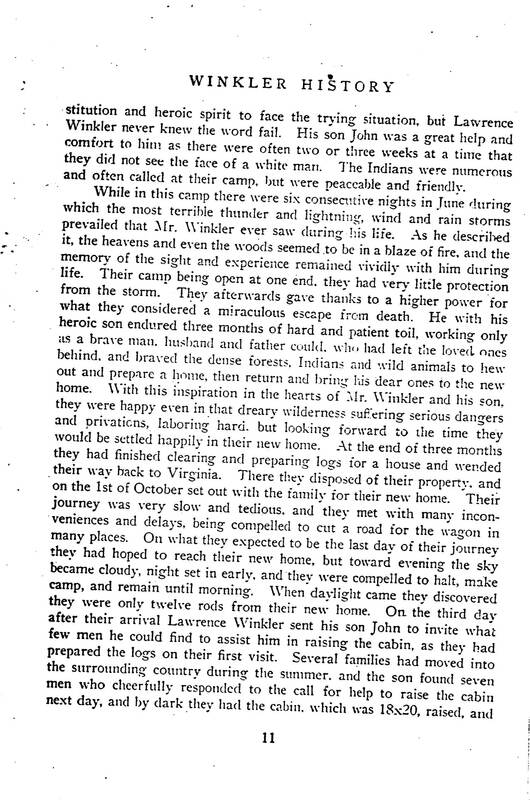 Lawrence's Will p.1 (1848)Three days after their arrival, Lawrence sent John out to gather all the men he could find around their rural wilderness homestead to assist in raising the cabin with the logs they had previously prepared. Several families had moved into the area that summer and John returned with seven men who were more than happy to respond to the call. By nightfall the Winklers had an 18x20 ft. cabin and a roof. Lawrence cut a door, built a fire and the family had a place they could call home. It appears that after about 12 or so years in Green, around the time of son John's marriage to Margaret Wilford, Lawrence hands his property over to his eldest son. Whether this was inheritance related, retirement related, general downsizing, or a wedding gift, I'm not sure. 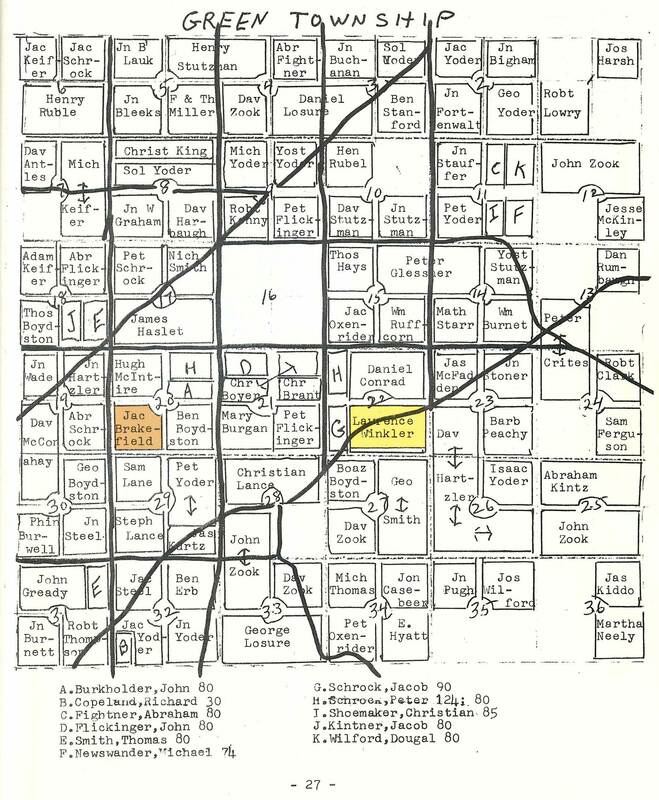 Lawrence and family moved a short distance west to Wayne Township where they settled down next to the Christian Alleman Family (Christian was father-in-law to Lawrence's son Jacob). 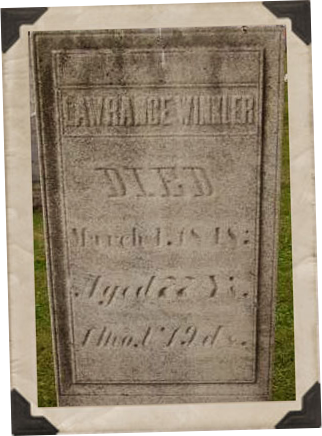 Lawrence Winkler died on 04 Mar 1848 in Wayne Township, Wayne, Ohio at the age of 77 years.5 He was buried soon after on the family farm in Wayne Township (later removed to the Wayne Presbyterian Church Cemetery).6 At Lawrence's time of death, he owned roughly 182 acres in Wayne Township. NOTE: A large portion of information here was Sourced from: The Winkler History, by W.S. Myers, 1900 in Dallas, TX; Published 1909 and verified against the obituary of Lawrence's son John, which was written 23 years prior to The Winkler History. See clarifications below. NOTE: Other portions of information here were Sourced from: The Big Payne Book, by John C. Payne with assistance from Toney L. Payne and Gale Payne Nagy, 2007 in Chattanooga, TN; Published 2007 and includes an extensive list of sources. NOTE: Many early facts that W.S. Myers noted about Lawrence Winkler seem to be untrue (A sentiment shared in The Big Payne Book by John C. Payne). He states Lawrence was originally born along the Rhine River in Prussia (Germany), however evidence contradicts this (see update below). He also mentioned that Fannie was from NJ and they were married there. No proof has been found of this either. Lawrence was living in NC at the time based on 1800 census records (Fanny too)1 and all evidence says Fanny was from Virginia. 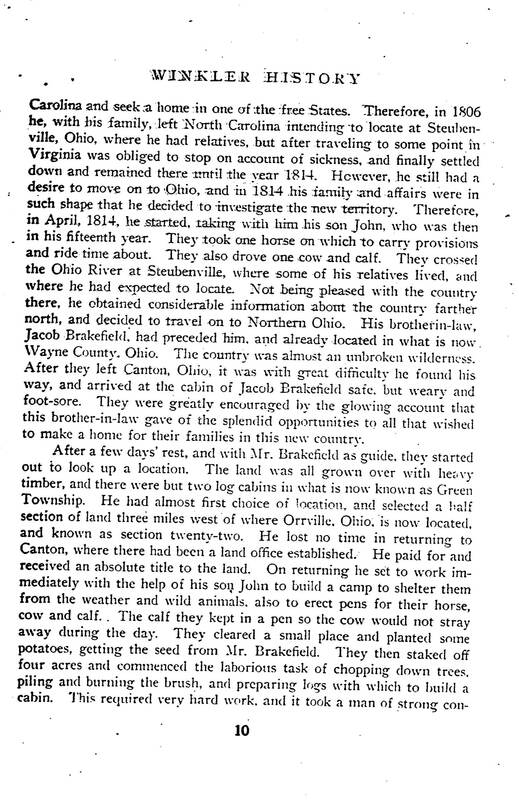 Information about siblings that traveled with Lawrence seems omitted as Jacob Brackbiel traveled with Lawrence, not ahead of him as they purchased their land at the same time. However, the majority of the information he relays about Lawrence and Fannie after their marriage matches up with recovered documents. As often as old family stories go, it is more likely the stories got crossed and over time became attributed to Lawrence himself instead of his ancestors. My personal belief (one also echoed in The Big Payne Book) is that Lawrence was born in New Jersey and moved to North Carolina at a young age. The New Jersey marriage is probably for Lawrence's parents (it has been fairly well documented that Lydia Colver married a Winkler in New Jersey) and his father was born along the Rhine river in Prussia. Son John's Obituary (1886)UPDATE: Since writing this I have stumbled across a website called the Winkler DNA Genealogy. 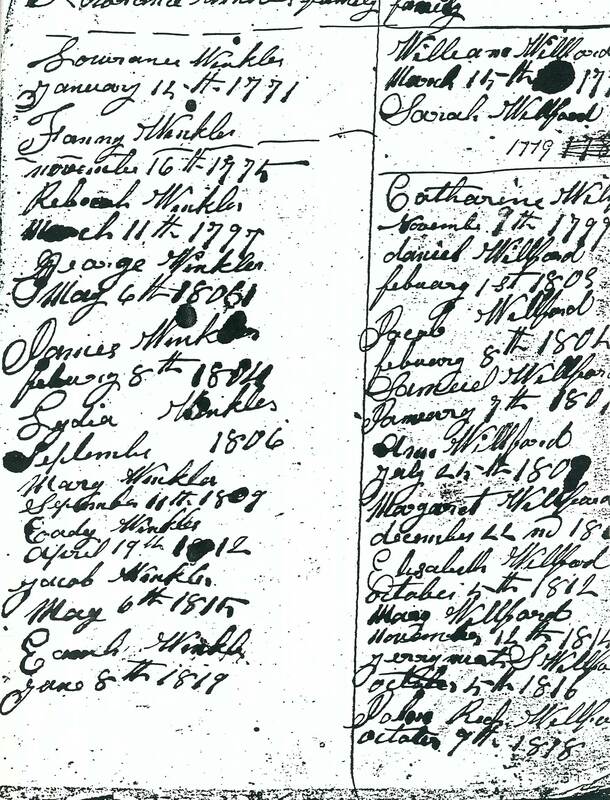 Here two volunteers, Rosemary and William, have taken the time to organize as many direct Winkler descendants as they could, list which Winkler ancestor their genealogy research has connected to them to, and share a specific string of their DNA results. The ultimate goal is to find enough people and who they descend from and use these DNA results to make a definitive connection back the next few generations (if possible). It seems DNA evidence has proven that that Lawrence indeed was born in the USA and that he descends from one of three Winkler ancestors who immigrated to Philadelphia in 1753 aboard the ship "Neptune". These three Winklers were Conradt, Hans Jacob, and Hans Domas (Thomas). If you are a direct WINKLER descendant along the paternal line (ie. your dad, his dad, his dad's dad... etc. were all Winklers) I highly recommend you look into joining this DNA project. You can request more information via the link above or visit FamilyTreeDNA.com for more information about DNA testing (I am not affiliated with FTDNA or the project, but it is run with their help). * There is no proof to show that these are actually Lawrence's parents. To clarify, it seems everyone agrees Lawrence descends from Hans Jacob. That was the belief in the 1800's and it continues on today. Lydia is a hunch based on the name Lydia being passed to a child of Lawrence's, names of her known family, the family lore of someone coming from New Jersey and Lydia's know marriage to a Winkler. ** This statement can also be contested. While it's definitely possible a sickness stopped the family in their tracks & caused them to re-evaluate their relocation, it's more likely a sickness would stop you for the winter, not for 7 and a half years; which is how long the family stayed in Monogalia County, Virginia. The family likely stopped because when they left Burke County, Fanny was about 3 months pregnant with daughter Lydia, and they wanted to find somewhere comfortable for her to give birth. A sickness could have followed this, possibly with Lydia, that prevented them from continuing before winter set in. *** Once again, this statement can also be contested. 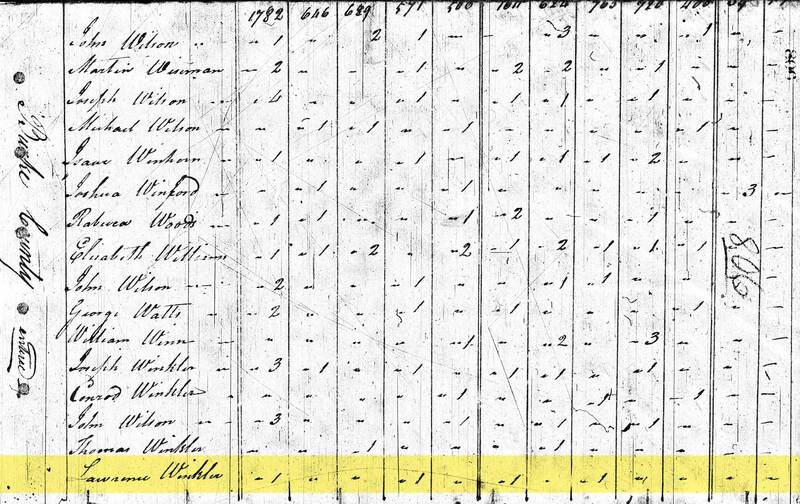 There are no known family members in Steubenville, Ohio on the 1800 or 1810 census; definitely no Winklers. That, however, doesn't mean this isn't a true statement. Lawrence could have married sisters or aunts living there. A William Payne was noted as living there, but that wasn't until the late 1820's. A I cannot confirm this beyond being an old family story, however census records do not make any mention of Lawrence owning slaves in 1800. 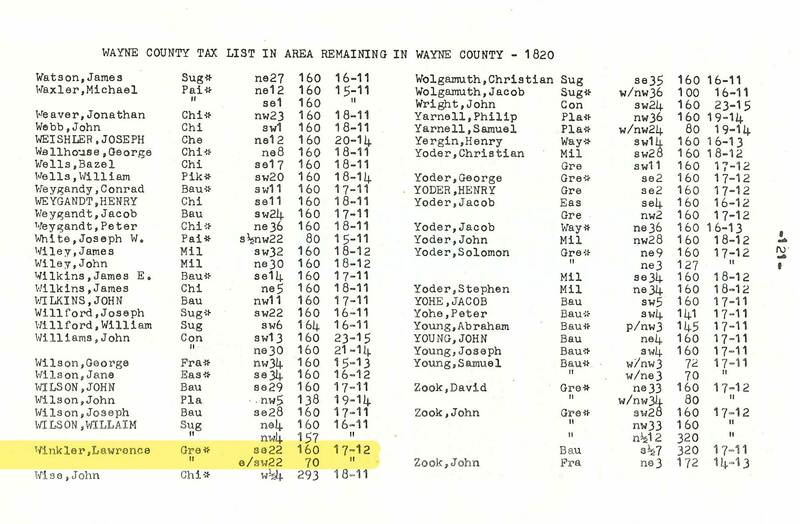 The Big Payne Book by John C. Payne also doubts this explanation and instead posits a more likely scenario: "Hans Jacob Winkler (who is present on the 1790 and 1800 census) dies in Burke County, NC in late 1802/early 1803 with his will being filed for probate in April 1803 (Burke Co. NC County Court Minutes 1799-1806, p379). The more logical explanation was Lawrence waited for his father's estate to be settled, took his share of the proceeds, and left the state." B Lawrence lived in on plot of land in Green Township for about 17 years of his life in Wayne County. 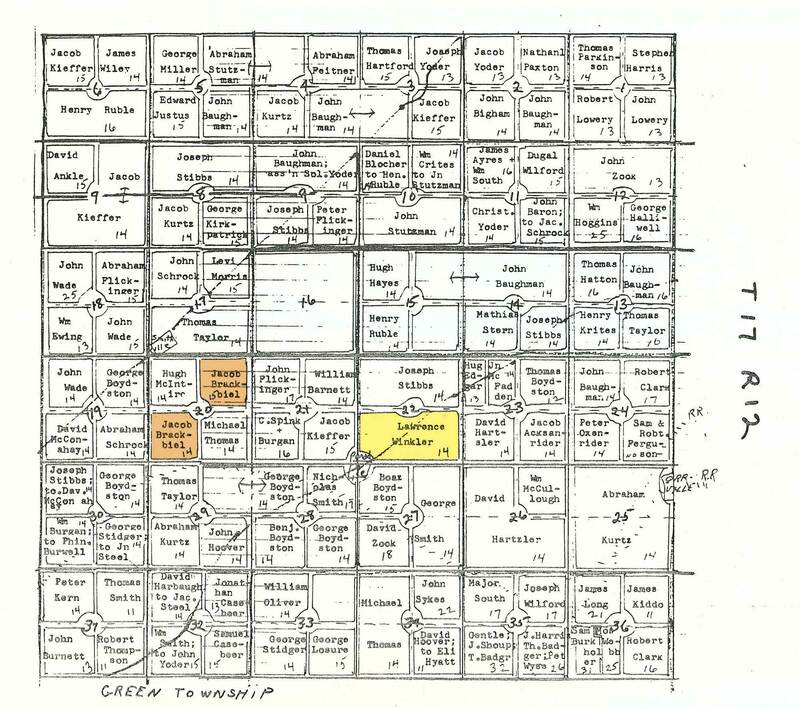 Only issue is, when he arrived, Green Township didn't exist (originally written as Greene). For about the first four years the area was know under East Union Township. Later, in 1818 Green Township was formed from part of East Union, which included the area that Lawrence and his family lived. They would later move to Wayne Township. 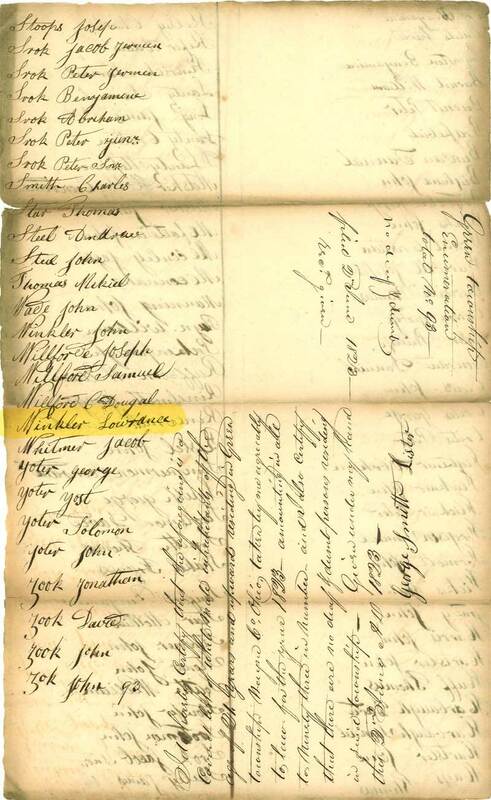 C Winkler History notes Lawrence's brother-in-law as "Jacob Brakefield", however he is listed on all manner of documents as Jacob Brackbiel. 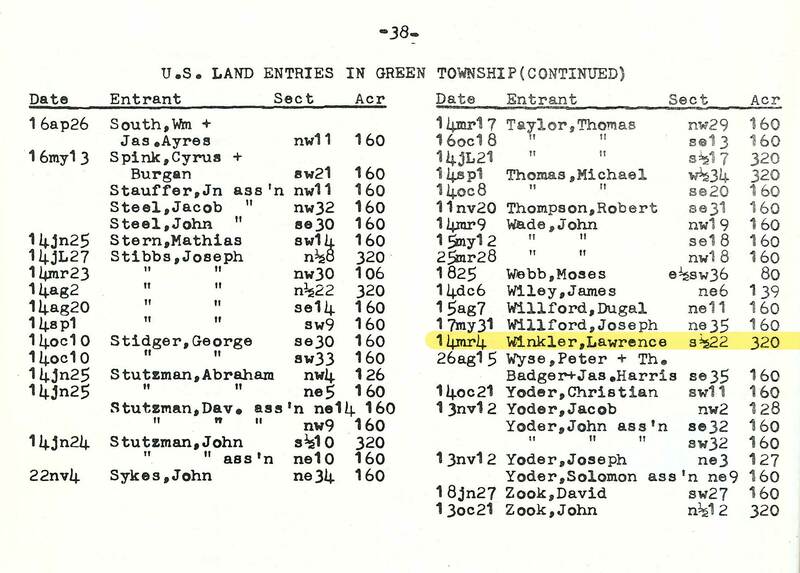 The statement about Jacob preceding Lawrence is also not true, tract books record that Jacob and Lawrence both purchased their land in Wayne County on the same day. 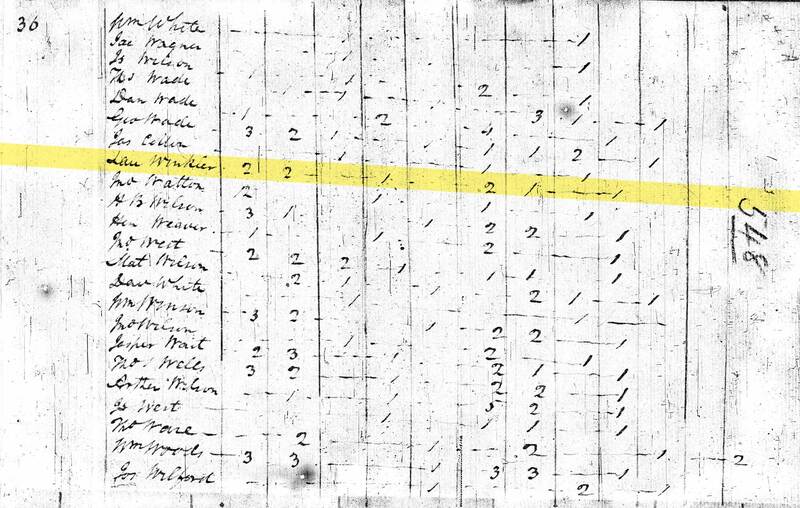 Jacob was also documented as being from Greene County, PA and the 1810 census notes he's from Whitley Township in Greene County. This is just north a few miles north of Monongalia County, Virginia. So, if Jacob is indeed Lawrence's brother-in-law, it means Lawrence didn't travel alone from North Carolina and was at least joined by a younger sister, if not more siblings. When they stopped in Virginia, his younger sister married Jacob sometime over the next 8 years. This also means Jacob likely accompanied Lawrence for the entire 1814 trip and not just the tour of Wayne County like the book seems to say. If Jacob gave a "glowing account of the area", it sounds more like he enjoyed what he was seeing and talked Lawrence into settling there with him rather than talking up his home through great experience and getting Lawrence to join him, which is how the book comes across. D Some people believe that Lawrence's father was born in Zell, Zurich, Switzerland and that cannot be substantiated. This information comes from an Ancestry.com "hint" that points to a "Millennium File" which also states that this "Hans Jakob" also DIED in Zell in 1797, long after our Jacob immigrated to America. 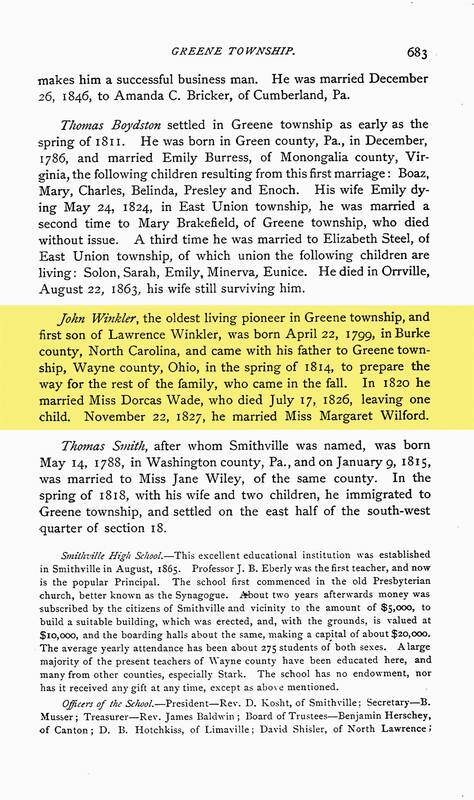 Our Jacob can also be found in 1790 in Burke County, NC just a few farms away from son Lawrence's father-in-law George Paine. 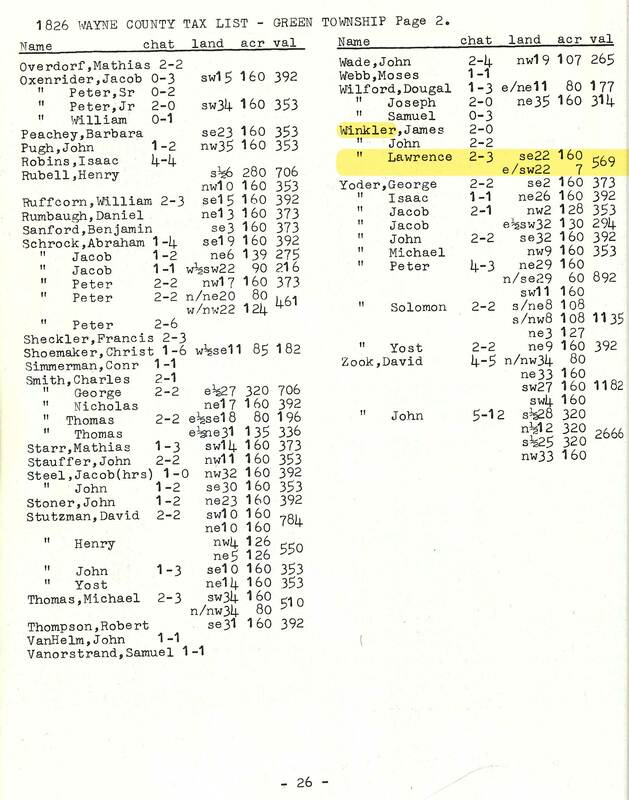 -- The "Millennium File" is a database created by the "Institute of Family Research" to track the records of its clients and the results of its professional research, but just because it shows up as a "hint" doesn't mean it's accurate to your ancestor, nor does it mean the research is accurate (the database definitely doesn't provide sources for us to check). E A note was made in The Big Payne Book by John C. Payne that Lawrence and Fanny were originally buried on their farm but later were moved to the cemetery. It's also noted that the Winklers were Methodists and the relocation had them buried at a Presbyterian Church (via email with Sarah Barker 21 Mar 2006). 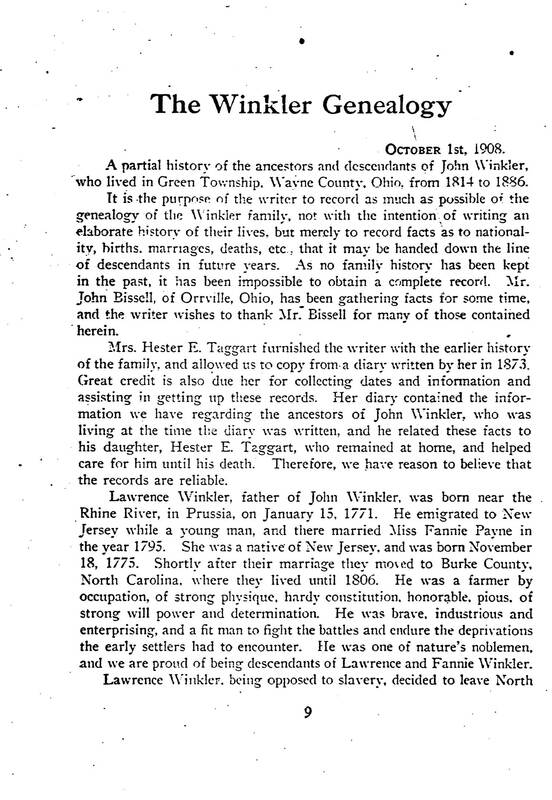 F A source in The Big Payne Book by John C. Payne states "In the Winkler Family History, compiled by W.S. Myers (n.d,), on p. 13 of the copy in the possession of Sarah Barker, there is a handwritten note that says 'The second death which occurred in Green Township was that of George Payne-father of Fanny Payne Winkler- in October 1819.'" I confirmed this via my own conversation with Sarah. G A common theme with family farm cemeteries is that generations pass, the land is sold off and the owners have no relation to the deceased individuals buried on their property, which may now even be subdivided into multiple lots. The grounds become neglected and fall into disrepair and/or become a burden on the current owners who have no connection to those who passed. This is where local churches, communities or governments step in and assist in the relocation of the gravesites to cemeteries where they will be maintained and remembered. 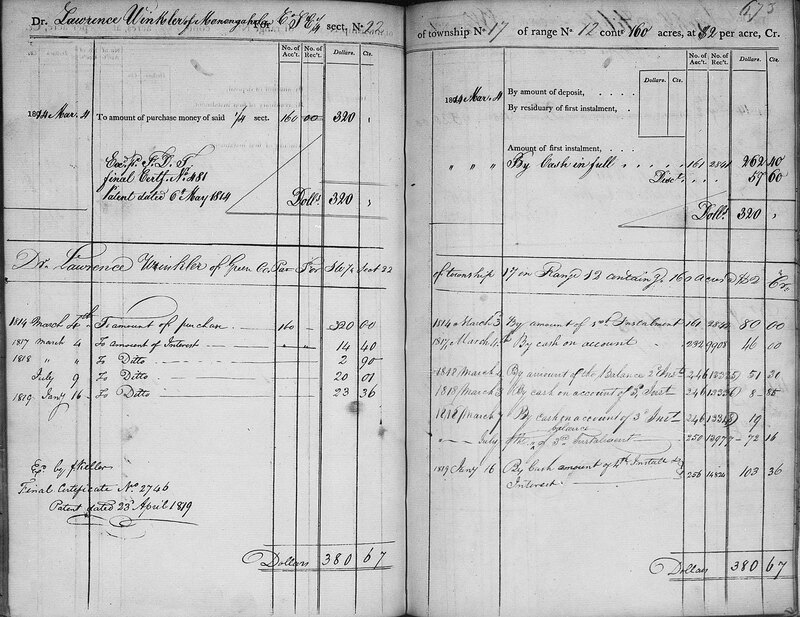 Are there any documents in existence to confirm Lawrence's parents or the first name of Lydia Colver's husband? Will anyone in Burke Co. ever get back to me in reference to Burke Co. NC County Court Minutes 1799-1806, p379? 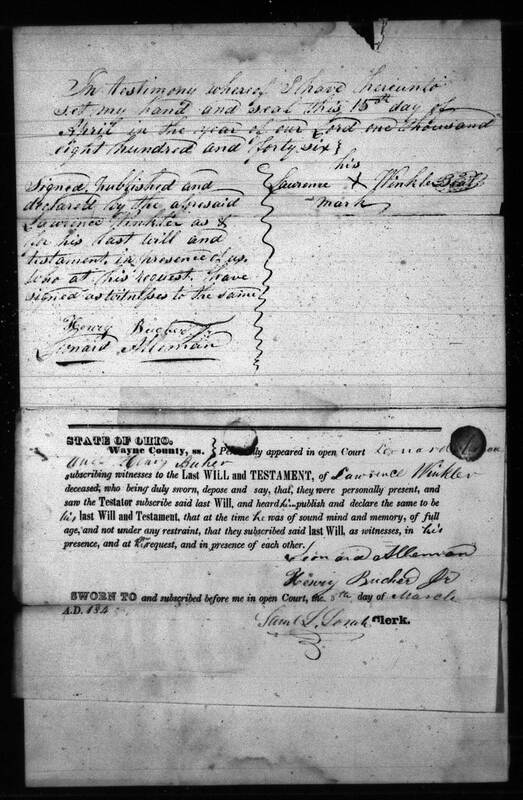 1 1800 United States Federal Census about Lawrence Winkler; Year: 1800; Census Place: , Burke, North Carolina; Roll: 29; Page: 806; Image: 231; Family History Library Film: 337905. 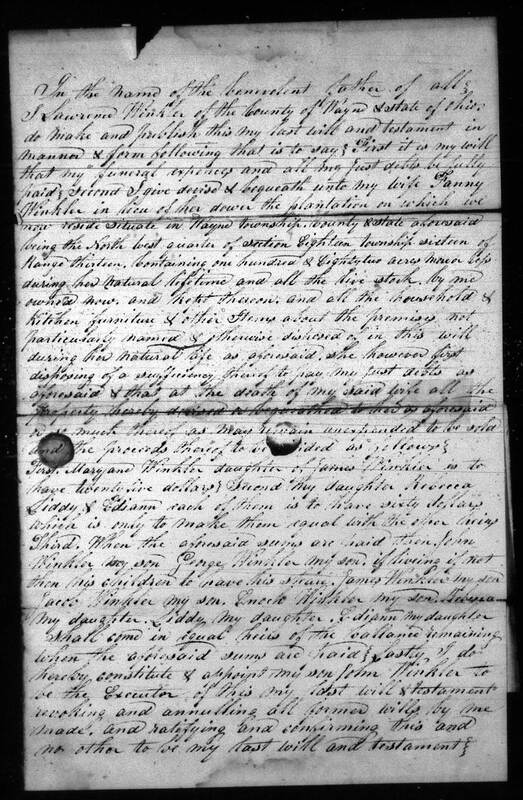 2 1810 United States Federal Census about Law Winkler; Year: 1810; Census Place: , Monongalia, Virginia; Roll: 69; Page: 548; Image: 0181429; Family History Library Film: 00848. 3 BLM GLO Records for Lawrence Winkler; U.S. Department of the Interior: Bureau of Land Management; General Land Office Records ( http://www.glorecords.blm.gov/search/default.aspx); Site Accessed: 17 Jan 2014; Wayne County, Ohio; Lawrence Winkler; Accession: CV-0021-179; Date: 6 May 1814. 4 BLM GLO Records for Lawrence Winkler; U.S. Department of the Interior: Bureau of Land Management; General Land Office Records ( http://www.glorecords.blm.gov/search/default.aspx); Site Accessed: 17 Jan 2014; Wayne County, Ohio; Lawrence Winkler; Accession: CV-0044-500; Date: 23 Apr 1819. 5 Headstone of Lawrence Winkler; Wayne Presbyterian Church Cemetery; Wayne Township, Wayne County, Ohio; Lawrance Winkler; 1848; Pair of tall slender headstones in front row of graves closest to church and main road. 6 Last Will and Testament of Lawrence Winkler; Will abstracts, estates and guardianships Wayne County, Ohio 1812-1851; Wooster Public Library; Family History Collection; Wayne County, Ohio; Lawrance Winkler; 8 Mar 1848. 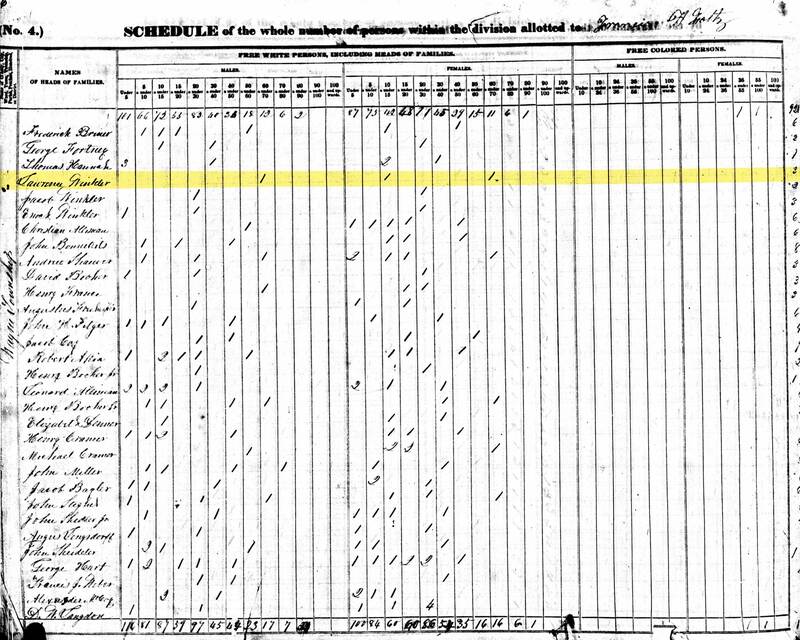 7 1850 United States Federal Census about Fanny Winkler; Year: 1850; Census Place: Wayne, Wayne, Ohio; Roll: M432_740; Page: 291B; Image: 145. 8 Headstone of Fanny Winkler; Wayne Presbyterian Church Cemetery; Wayne Township, Wayne County, Ohio; Fanney wife of Lawrence Winkler; 1859; Pair of tall slender headstones in front row of graves closest to church and main road.